As an experimental first-track made in Blender, 'thought a larger track would be a good choice for practice. I intend to make other planetary tracks in Blender in order to get better at it. Most of the information is in the readme, but I do plan on updating the track at some point. But for now, it is raceable, and had countless testing done on it day in and day out since October. Use a fast car if you don't want to spend too much time, otherwise use any car. Let me know if there are more bugs so I can fix 'em upz, yeahz? *Small typo in the readme changed. *Io scaled down in the background. *Background replaced with rotating background. Objects "Skybox" and "Clouds" are still present, but aren't seen unless you exit the planet. *Io (cheezeballz) is removed since it's glitching for some players. 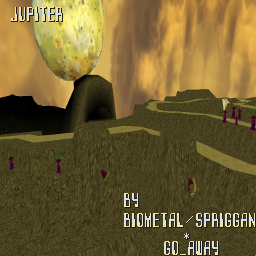 *Floaters do not have ENVMAP on them anymore.